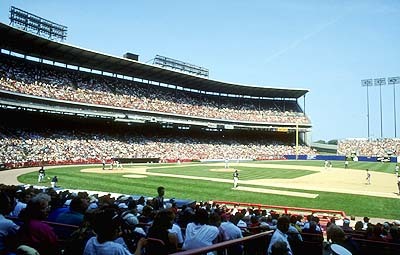 Home of two baseball teams during its tenure, County Stadium was the first stadium built in the second half of the 20th century. 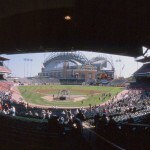 A new stadium for metropolitan Milwaukee was first discussed in 1909, but talks did not intensify until 40 years later. 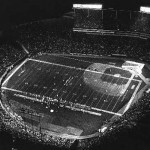 In 1949, several sites were proposed as possible locations for a stadium. 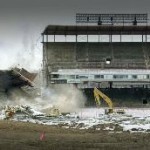 The site chosen was a garbage dump and construction of the stadium began October 19, 1950. 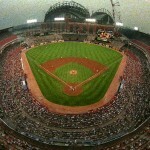 Built of steel and concrete the new ballpark would house baseball, football and other events. 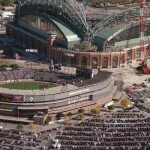 It was constructed so if Milwaukee received a professional baseball team, the stadium could be expanded. 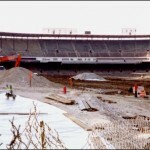 Construction was slow because of labor strikes and shortages of materials. 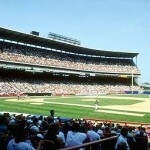 Two MLB teams became interested in moving to the new stadium, the St. Louis Browns and the Boston Braves. 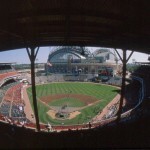 The Boston Braves received permission and moved to Milwaukee for the 1953 season. 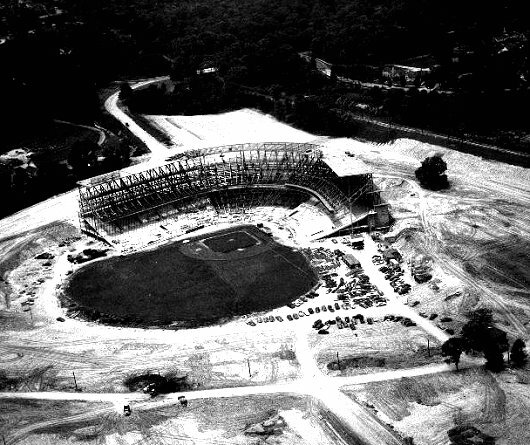 Construction was finally completed and the ballpark was named County Stadium. 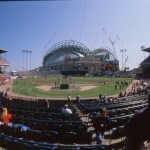 The Boston Braves were renamed the Milwaukee Braves and opening day for the team at County Stadium was on April 14, 1953. 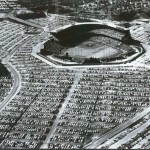 County Stadium had a capacity of 28,111 that consisted of a double decked grandstand down the first and third base lines, a lower level of seating that extended to the foul poles and bleachers were in the outfield. 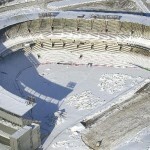 The upper grandstand consisted of wooden bleachers. 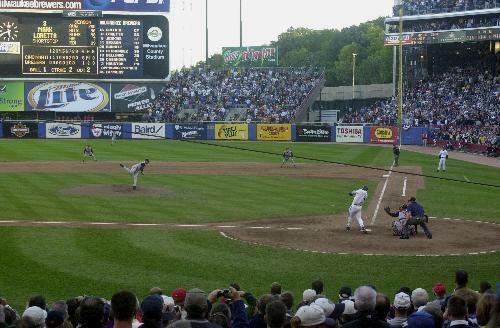 A state of the art Miller High scoreboard was located in right field with a Longines clock on top. 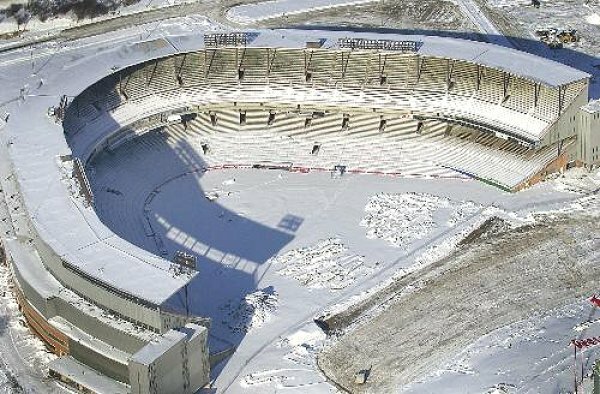 The Green Bay Packers (NFL) began playing at County Stadium on September 27, 1953. 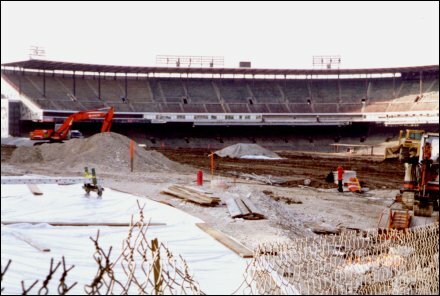 In order for the baseball diamond to become a football gridiron, the bleachers behind the left field wall were moved into the playing area in left field. 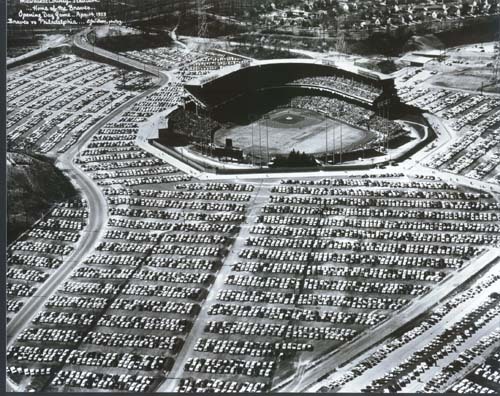 With soaring attendance at County Stadium, the grandstands that were single decked down the foul lines were double decked by the 1954 season, increasing the capacity to 43,340. 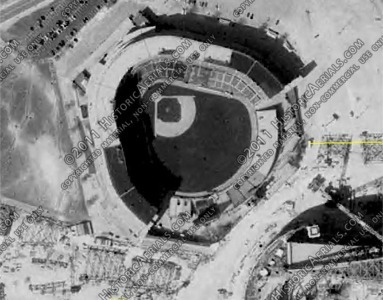 Trees were planted in the batters backdrop in centerfield and a picnic area known as the Braves Reservation was added between the outfield bleachers in 1960. 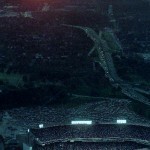 By 1959 attendance at County Stadium began to drop and when new owner, William Bartholomay, purchased the club in 1962 he began looking to move the team. 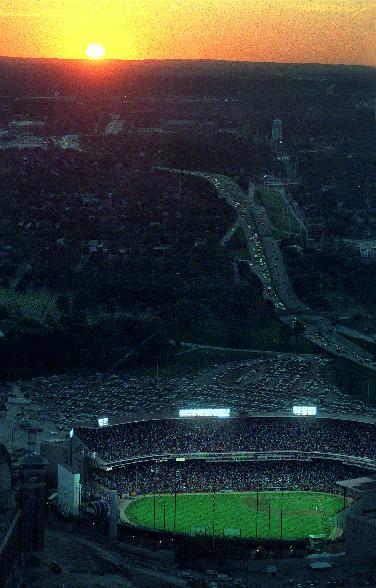 On March 5, 1964 the Braves announced they would move to Atlanta after the 1965 season. 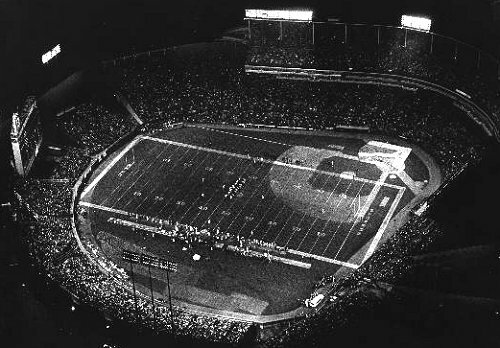 The Milwaukee Braves played their last game at County Stadium on September 12, 1965, moving to Atlanta Stadium the following season. 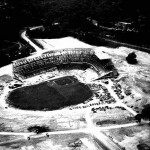 Without baseball, the Packers were the only main tenant and they only played half of their games at County Stadium. 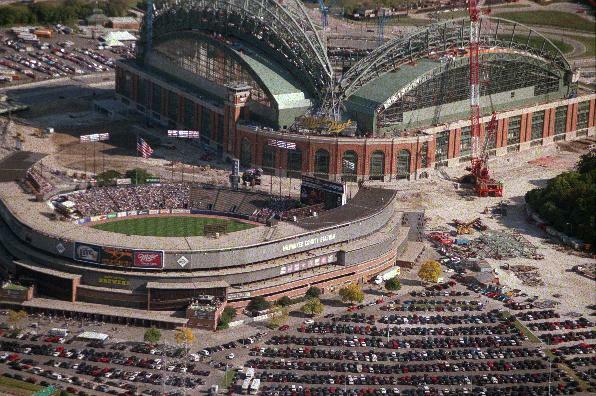 A group including Bud Selig began trying to get MLB to expand to Milwaukee. 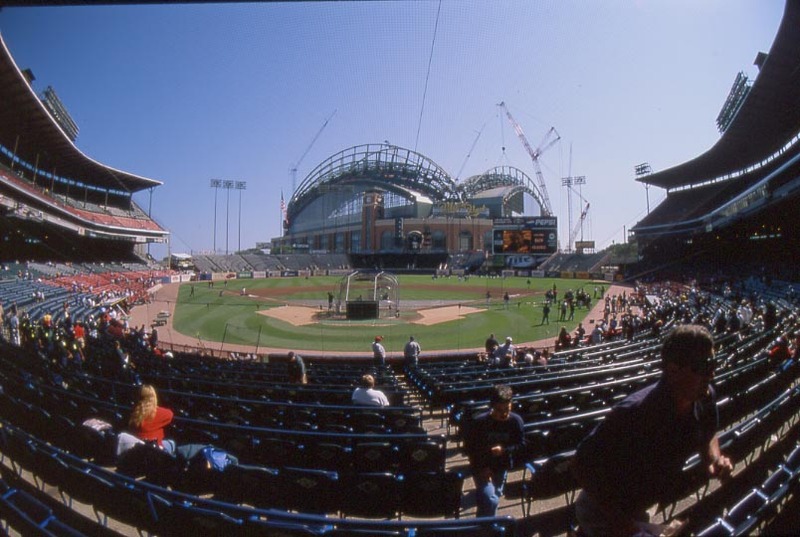 Selig was able to get White Sox owner Arthur Allyn to bring his club to County Stadium and play 20 home games throughout the 1968 and 1969 seasons where they were a hit at the box office. 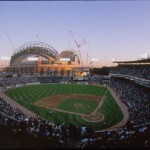 MLB did not grant Milwaukee an expansion franchise in 1969 and Selig purchased the financially struggling Seattle Pilots and moved them to Milwaukee for the 1970 season. 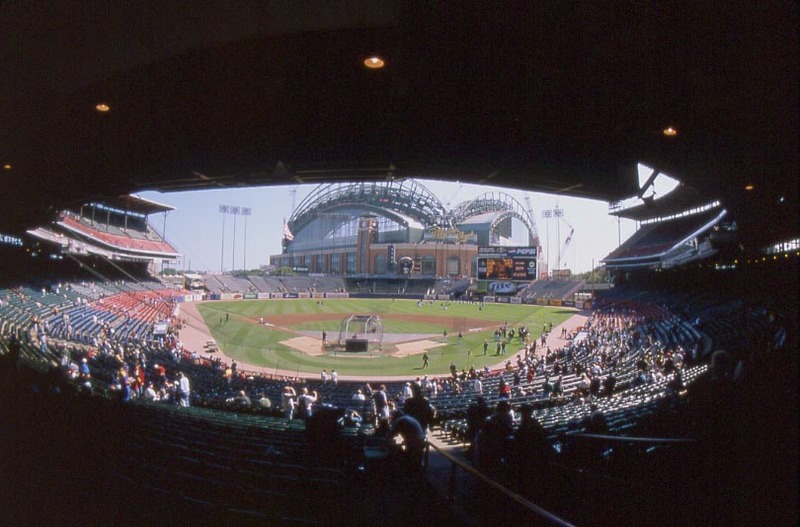 On April 7, 1970 Major League Baseball returned to Milwaukee when the Milwaukee Brewers played their first game at County Stadium against the California Angels. 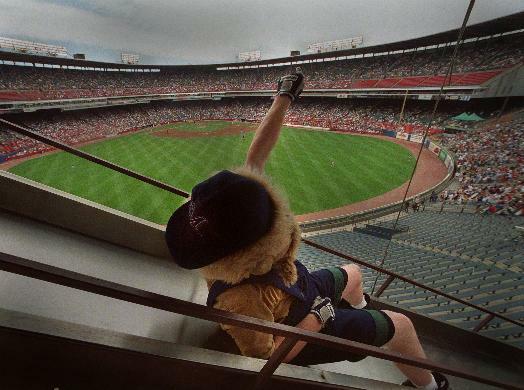 County Stadium became known for its mascot Bernie the Brewer, his beer barrel, chalet and slide that was added in 1973 behind the bleachers in centerfield. 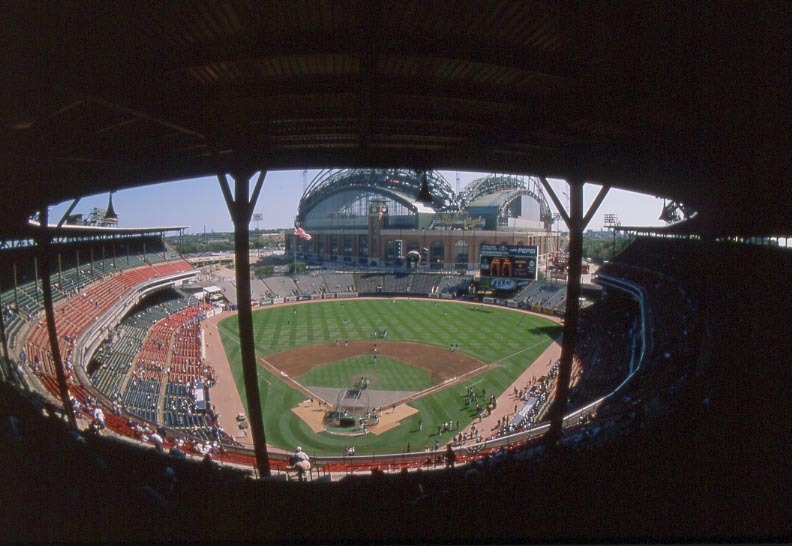 In the 1970s the stadium was enlarged to seat over 52,000 fans as the upper deck was expanded over the uncovered lower grandstand to the foul poles. 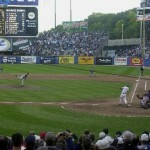 The pressbox was remodeled and a new scoreboard was also installed. 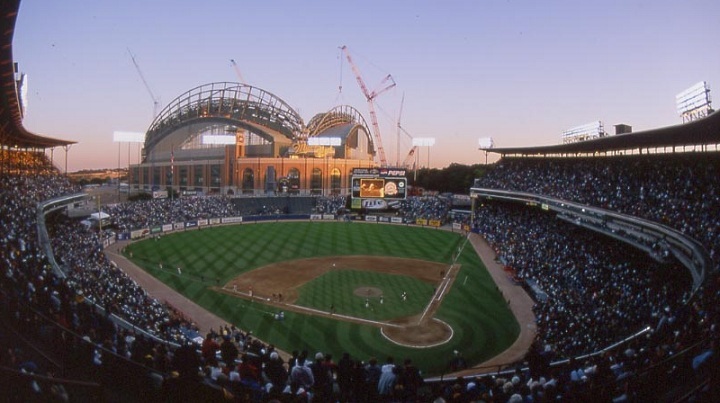 During the late 1980s the Brewers began lobbying for a new ballpark. 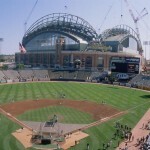 Construction of their new ballpark, Miller Park began in 1996. 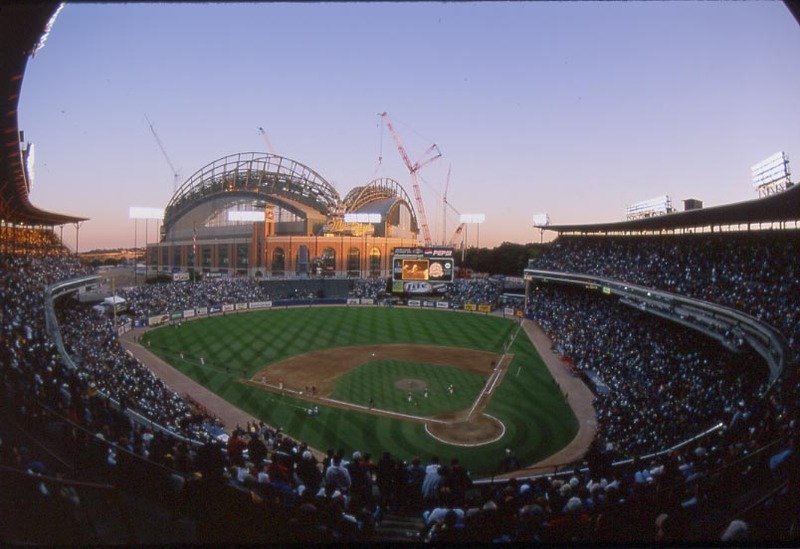 Fans visiting County Stadium in the last years of its existence saw Miller Park rise beyond the bleachers in the outfield. 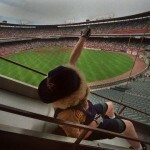 Other than being entertained by Bernie the Brewer, racing sausage figures ran around the stadium during the game. 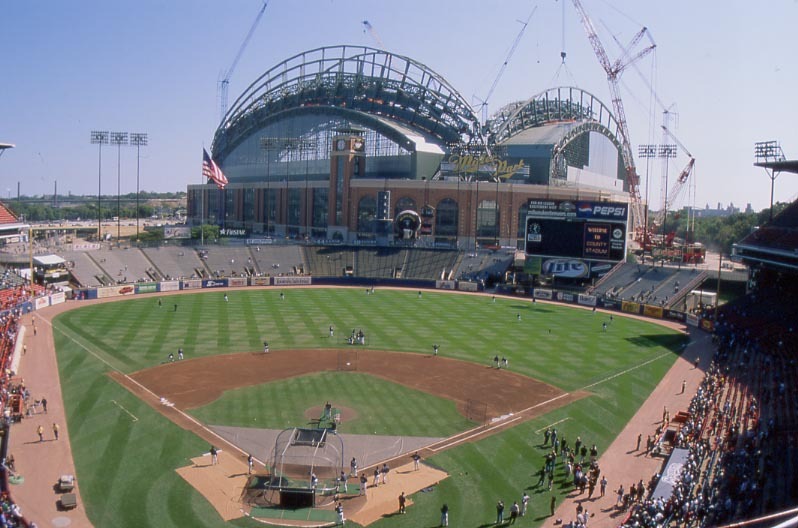 The last year for County Stadium was scheduled for 1999 but a crane accident at Miller Park delayed completion of the stadium by one year. 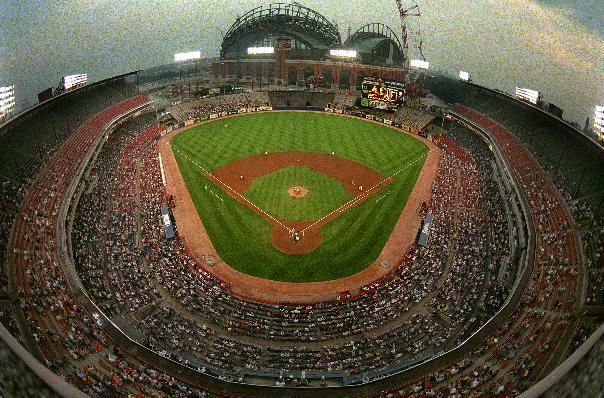 The Brewers played their final game at County Stadium on September 28, 2000 against the Cincinnati Reds. 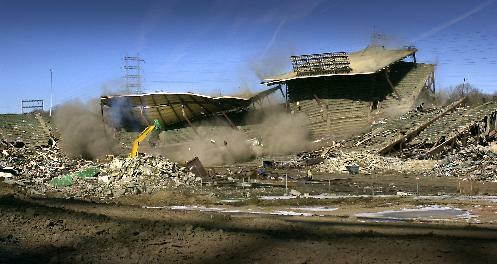 It was demolished the following winter and is now the site of a Little League baseball park, Helfaer Field.